PYONGYANG, North Korea (AP) — North Korea has extended the run of its iconic mass games, which it revived last month to mark the country's 70th birthday. Despite a travel ban blocking tourists from the U.S. and pricey tickets for tourists from other countries, the games — which involve tens of thousands of gymnasts, dancers and flip-card-wielding hordes in the stands — appear to once again be a hit, filling Pyongyang's 150,000-seat May Day Stadium more than a month after they resumed to end a 5-year hiatus. For the past month, to celebrate the 70th anniversary of the country's independence on Sept. 9, North Korea has been staging its latest version of the games, called "The Glorious Country." Performances had been expected to conclude on Oct. 10. Ticket sales appear to be good — the stadium was nearly full on Thursday, with many Chinese and some Japanese tourists — despite a travel ban that has stopped American tourists from visiting and seats for foreigners and VIPs that begin at $110 and go up to nearly $900. The performances run about two hours and are divided into "chapters" that depict important ideas or stages in the growth of the nation. One of the highlights of this year's performance is a segment on Korean reunification that depicts leader Kim Jong Un greeting South Korean President Moon Jae-in for their historic summit earlier this year. 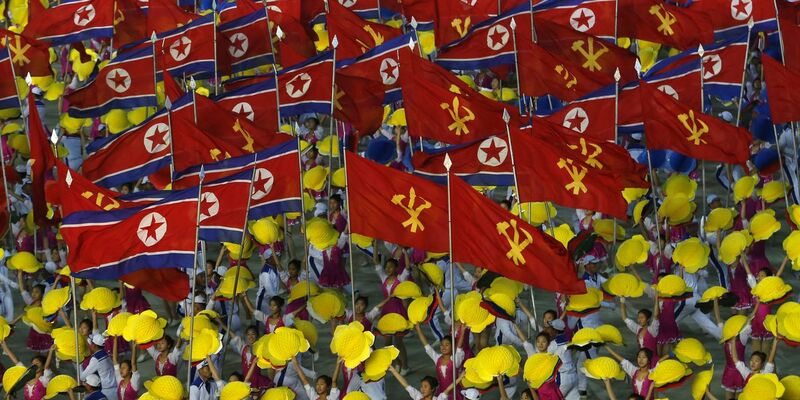 North Korea first staged its mass games in 2002, when Kim's father, Kim Jong Il, was the country's leader. They continued almost without interruption on an annual basis until 2013.